William “Deacon’. Brodie was born at Brodie’s Close, Lawnmarket, Edinburgh, the eldest of 11 children, on 28 September 1741. He was well educated and by the age of 22 was a Burgess, or freeman, of Edinburgh. In 1781 he became deacon (trade union leader) of the Incorporation of Wrights and succeeded his father on the town council where he served for six of the next seven years, until his death. He probably met Dr Samuel Johnson in this role and was certainly a friend of Robert Burns. Something of a dandy, Brodie stood just 1.62 m (5 ft 4 in) tall but was always immaculate in his dress. However, the face of respectability by day, by night he was a masked thief and a leader of a gang of robbers. He also kept two mistresses, Jean Watt and Anne Grant, by whom he fathered five children in 13 years. Edinburgh shopkeepers hung their keys inside their shop doorways, making it easy for Brodie to make impressions of the keys in a small box filled with putty he carried with him. 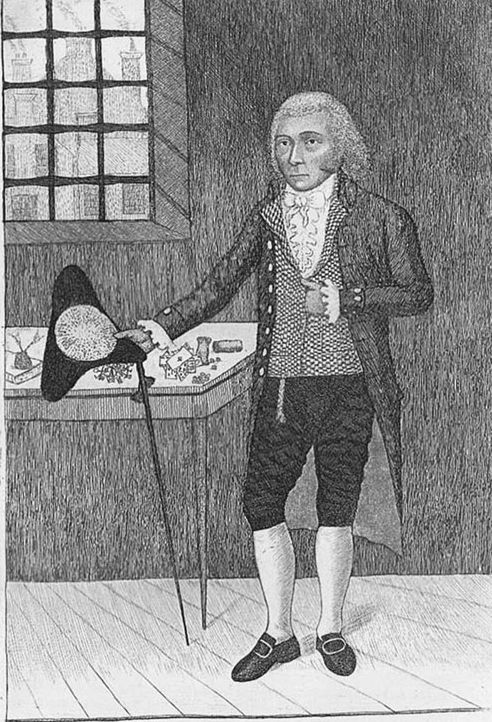 In August 1786 Brodie and his gang stole £800 from Royal Exchange bankers and robbed several goldsmiths on Parliament Close. At 1am 30 October 1787 the college mace was stolen from the university library. In 1788 a silk shop in the High Street was burgled and the Lord Advocate, Ilay Campbell of Succour, offered to pardon any gang members who turned king’s evidence. The offer produced no results and in February 1788 Brodie was called to serve on a murder trial jury. On 8 March Brodie and his gang, John Brown, George Smith and Andrew Ainslie, attempted to rob the town’s General Excise Office at Chessel’s Court on the Canongate and a few days later Ainslie gave the authorities the names of the gang. On 12 March Brodie fled to London and then to Holland, from where he intended going to America but he was extradited back to Edinburgh, arriving on 17 July. Deacon Brodie and George Smith went on trial on 27 August 1788. Brown by this time was also a prosecution witness. Found guilty, they were hanged at the Tolbooth gallows on 1 October before 40,000 people. Brodie described his execution as “A leap in the dark.” John Brown was eventually hanged in England for another crime and Andrew Ainslie was deported to Botany Bay, Australia. The story of Deacon Brodie inspired Robert Louis Stevenson to write two plays and one novel on the case. The latter Longmans published as The Strange Case Of Dr Jekyll And Mr Hyde in January 1886, costing one shilling.